Queens, New York City, New York U.S. Under Bettman, the NHL has seen rapid growth of league revenues, from $400 million when he was hired to over $3.0 billion in 2010–11. He also oversaw the expansion of the NHL's footprint across the United States, with six new teams added during his tenure, bringing the NHL to 30. In May 2014, Bettman was named "Sports Executive of the Year" by the SportsBusiness Journal and SportsBusiness Daily. And in 2016, Bettman was inducted as a member of the International Jewish Sports Hall of Fame. However, Bettman's tenure in the NHL has been controversial. He has often been criticized for attempting to "Americanize" the game, and expanding the league into non-traditional hockey markets such as the American South at the expense of the more traditional markets in Canada and the Northern United States. 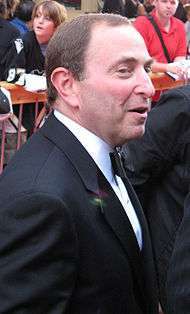 Bettman has also been a central figure of three labor stoppages, including the 2004–05 NHL lockout that saw the entire season canceled. These controversies have made him unpopular with many fans around the league. Bettman is Jewish and lives with his wife, Shelli, and their three children Lauren, Jordan, and Brittany. He is a resident of Saddle River, New Jersey. Half brother Jeffrey Pollack was the Commissioner of the World Series of Poker. This move towards Southern markets was heavily criticized as well, however, with fans in Canada and the Northern United States lamenting the move away from "traditional hockey markets." Critics have also accused Bettman of having an "anti-Canadian" agenda, citing the relocation of the franchises in Quebec City and Winnipeg and his apparent refusal to help stop it, along with the aborted sale of the Nashville Predators in 2007 to interests that would have moved the team to Hamilton, Ontario. Jim Balsillie accused Bettman of forcing the Predators to end negotiations with him to purchase the team. Bettman was satirized in this vein as the character "Harry Buttman" in the 2006 Canadian movie Bon Cop, Bad Cop. The results of expanding to Southern markets has been mixed. There has been in fact significant growth in the sport of hockey at the grassroots level with children in the U.S. South playing the game in increasing numbers. And Southern teams like the Anaheim Ducks, Carolina Hurricanes, Dallas Stars, and Tampa Bay Lightning have been successful on the ice and have won the Stanley Cup. However, some of these Southern teams have not been as successful. The Phoenix Coyotes eventually filed for bankruptcy in May 2009 after incurring several hundred million dollars of losses since their 1996 move from Winnipeg. Under Bettman, the league then took control over the team later that year in order to stabilize the club's operations and then resell it to a new owner who would be committed to stay in the Phoenix market. However, Bettman and the NHL still have not finalized a deal with any new owner for the sale of the Coyotes. Complicating matters is the Goldwater Institute, a taxpayer advocacy group, who is threatening to sue if any deal involves the sale of bonds by the City of Glendale to subsidize the potential new owner. Keeping the team afloat for now is the City of Glendale itself: after paying $25 million for the 2010–11 season to the NHL, another agreement was reached for the city to pay another $25 million to the league keep the Coyotes at Jobing.com Arena for the 2011–12 season. The 1994–95 lockout lasted 104 days, causing the season to be shortened from 84 to 48 games. A key issue during the lockout was the desire to aid small market teams. Led by Bettman, the owners insisted on a salary cap, changes to free agency and arbitration in the hopes of limiting escalating salaries, the union instead proposed a luxury tax system. The negotiations were at times bitter, with Chris Chelios famously issuing a veiled threat against Bettman, suggesting that Bettman should be "worried about [his] family and [his] well-being", because "Some crazed fans, or even a player [...] might take matters into their own hands and figure they get Bettman out of the way." "It is my sad duty to announce that because a solution has not yet been attained, it is no longer practical to conduct even an abbreviated season. Accordingly, I have no choice but to announce the formal cancellation of play." As in 1994, the owners' position was predicated around the need for a salary cap. In an effort to ensure solidarity amongst the owners, the league's governors voted to give Bettman the right to unilaterally veto any union offer as long as he had the backing of just eight owners. The players initially favored luxury tax system, and a 5% rollback on player salaries — later increased to 24 percent. As the threat of a canceled season loomed, the players agreed to accept a salary cap, but the two sides could not come to terms on numbers before the deadline expired. The NHL's television fortunes faded after the ABC/ESPN deal. In 2004, the league could manage a revenue sharing deal with only NBC, with no money paid up front by the network. Also, coming out of the lockout, ESPN declined its $60 million option for the NHL's cable rights in 2005–06. While wishing to retain the NHL, it stated the cost was overvalued. However, Bettman was able to negotiate a deal with Comcast to air the NHL on the Outdoor Life Network channel, which was later renamed Versus in 2006. The three-year deal was worth $207.5 million. Bettman has been heavily criticized for the move to Versus, as detractors have argued that the league has lost a great deal of exposure since moving to the much smaller network. The TV deal with Versus was later extended through the 2010-11 season. Bettman's controversial decisions, as well as presiding over three labor stoppages, have made him unpopular among many NHL fans. He is regularly booed in various arenas around the league, ranging from his appearances at the yearly NHL Entry Draft to his annual presentation of the Stanley Cup to the league champion at the end of every season. When asked if the booing ever bothers him, Bettman said, "Not doing this job, no. You're always going to have critics. What I've always told people: If I take the ice and it's completely silent, then I'll know I'm in trouble." In another interview, he replied that he says to himself, "You know what, [the fans] got an opinion. We may not agree on everything, but they care, and I'll take that." Still, writers such as Adam Proteau of The Hockey News and James O'Brien of NBC Sports' Pro Hockey Talk have advocated that someone else should hand out the Cup instead of Bettman so that the incessant booing does not spoil the ceremony. In 2013, Grantland stated that Bettman's Cup presentations have "evolved into one of the most awkward traditions in all of sports". On May 21, 2014, Bettman was named "Sports Executive of the Year" by the SportsBusiness Journal and SportsBusiness Daily at the publications' annual Sports Business Awards event in New York. At the same ceremony, the NHL was named "Sports League of the Year," the second time in four years the NHL has been so honored. The 2014 Bridgestone NHL Winter Classic was named "Sports Event of the Year." Bettman said, "It’s almost an out-of-body experience. This time of year, I’m normally presenting a trophy and getting booed. To receive one and get applause is really quite novel." 1 2 3 "In-depth: NHL Labour Strife – Gary Bettman". CBC Sports. Archived from the original on March 9, 2008. Retrieved 2008-02-28. ↑ Mickle, Tripp (2007-05-14). "NHL revenue tops $2.2B". Sports Business Journal. Street and Smith's. Retrieved 2008-02-28. 1 2 Peters, Chris (22 May 2014). "Sports Executive of the Year: Gary Bettman, NHL". sportsbusinessdaily.com. Retrieved 22 May 2014. 1 2 Gary Bettman's page on the International Jewish Sports Hall of Fame website. ↑ Wetzel, Dan (2004-04-26). "Woe Canada". Yahoo! Sports. Retrieved 2010-06-12. ↑ Allen, Kevin; Brehm, Mike (2005-02-21). "Black ice: NHL season canceled". USA Today. Retrieved 2008-02-28. 1 2 Keating, Steve (2013-01-31). "After 20 years of booing, Gary Bettman still standing". Reuters. Retrieved 2016-06-15. ↑ WEDDINGS/CELEBRATIONS; Lauren Bettman, Brian Gershengorn, The New York Times, August 17, 2003. Accessed February 16, 2008. ↑ Negreanu, Daniel. Poker Superstars III and Dinner with Jeffrey Pollack 10 Nov, 2005. Fullcontactpoker.com. Accessed 7/27/07. ↑ Lapointe, Joe (1992-11-29). "HOCKEY; N.H.L. Considers An N.B.A. Officer". New York Times. Retrieved 2008-02-28. ↑ Loria, Keith (Summer 2003). "Boom or bust? We evaluate NHL commissioner Gary Bettman's turbulent first decade at the helm of the league". Hockey Digest. Retrieved 2008-02-28. ↑ "NHL Commissioner talks hockey with Cornell students". Cornell University. 2007-11-15. Archived from the original on 2008-07-06. Retrieved 2008-02-28. ↑ Joe Lapointe (1992-12-13). "The N.H.L. Employs A Head for Business". New York Times. Retrieved 2008-03-06. ↑ Joe Lapointe (1993-02-02). "Opening Day for N.H.L. 's First Commissioner". New York Times. Retrieved 2008-03-06. ↑ Joe Lapointe (1993-03-02). "Miami, Anaheim In Debut Next Fall". New York Times. Retrieved 2008-03-06. 1 2 Keith Loria (Summer 2003). "Boom or bust? We evaluate NHL commissioner Gary Bettman's turbulent first decade at the helm of the league". Find Articles (reprint). Hockey Digest. Retrieved 2008-03-06. ↑ Naylor, David (2007-07-14). "Never in Hamilton". The Globe and Mail. Toronto. Retrieved 2009-06-07. ↑ Burnside, Scott (2007-07-21). "Balsillie group accuses Bettman of forcing Preds to break off talks". ESPN. Retrieved 2008-03-06. ↑ Wente, Jesse. "Movie Reviews on Metro Morning". Metro News. Archived from the original on January 16, 2009. Retrieved 2008-03-13. ↑ Duhatschek, Eric (2007-04-12). "Northern alienation isn't new but it's growing". The Globe and Mail. Toronto. Retrieved 2008-03-06. ↑ Terry Frei (2007-09-07). "Now more than ever, the American hockey player has options". ESPN. Retrieved 2008-03-06. ↑ Rosenblatt, Joel (October 27, 2009). "Phoenix Coyotes Owner Moyes Will Sell Bankrupt Team to NHL". Bloomberg.com. Retrieved May 10, 2010. ↑ Klein, Jeff Z. (October 27, 2009). "Rangers End Their Slump as Coyotes Agree to a Sale". New York Times. Retrieved May 10, 2010. ↑ Sanders, Rebekah (May 6, 2011). "Glendale may pay NHL for more time to find Phoenix Coyotes buyer". Arizona Republic. 1 2 3 "We've been here before". CBC. Archived from the original on February 25, 2008. Retrieved 2008-03-06. ↑ Wigge, Larry (1996-05-06). "Rink Brat? — Chicago Blackhawks defenseman Chris Chelios". The Sporting News. Retrieved 2008-06-09. ↑ Roberts, Selena (1998-11-29). "N.B.A. May Take Page From the N.H.L. Guide to Labor Peace After a Lockout". New York Times. Retrieved 2008-03-06. ↑ "Counsel presents league's position". New York Times. 2004-02-12. Retrieved 2008-03-13. 1 2 3 "Lockout chronology". CBC. 2005-07-13. Archived from the original on March 3, 2008. Retrieved 2008-03-13. ↑ Heika, Mike (2005-07-27). "NHL labor timeline". Dallas Morning News. Retrieved 2008-03-13. ↑ "Goodenow steps down from NHLPA post". TSN.ca. 2005-07-28. Archived from the original on August 18, 2007. Retrieved 2008-03-13. ↑ "Key terms of NHL agreement". ESPN. 2005-07-13. Retrieved 2008-03-13. ↑ "Worst Managers - Gary Bettman". Business Week. 2005-01-10. Archived from the original on 2007-12-24. Retrieved 2008-03-13. ↑ Swift, E.M. (2005-11-03). "My Sportsman Choice: Gary Bettman". Sports Illustrated. Retrieved 2008-03-13. ↑ Hackel, Stu (January 6, 2013). "Tentative deal reached to end lockout". Time Inc. Archived from the original on January 8, 2013. Retrieved January 6, 2013. ↑ "Sources: NHL makes first CBA offer". ESPN. July 14, 2012. Retrieved September 11, 2012. ↑ Beacon, Bill (September 14, 2012). "Labour board turns down players' request to block NHL lockout in Quebec". The Vancouver Sun. Retrieved September 17, 2012. ↑ "Alberta labor board sides with NHL in lockout ruling". National Hockey League. October 10, 2012. Retrieved October 11, 2012. ↑ McGran, Kevin (November 26, 2012). NHL lockout: Mediators called in for meetings this week. The Hamilton Spectator. Retrieved November 26, 2012. ↑ Strang, Katie. "Mediation yields no progress". ESPN. November 29, 2012. Retrieved November 29, 2012. ↑ Macramalla, Eric (December 11, 2012). "LEGAL LOOK: DECERTIFICATION VS. DISCLAIMER OF INTEREST". The Sports Network. BellMedia. Retrieved December 21, 2012. ↑ "NHL will seek to cancel contracts if NHLPA dissolves". Toronto Sun. December 15, 2012. Retrieved December 16, 2012. ↑ "NHL files lawsuit, labor charge against union". Fox News Channel. December 14, 2012. Retrieved December 15, 2012. ↑ "NHLPA eyes breakup; NHL fires back". ESPN. December 14, 2012. Retrieved December 15, 2012. ↑ Strang, Katie. "NHLPA gives board OK on dissolution". ESPN. December 21, 2012. Retrieved December 21, 2012. ↑ Canadian Press (January 6, 2012). "NHL lockout ends: Here are the (tentative) highlights of their new deal". National Post. Archived from the original on January 6, 2013. Retrieved January 8, 2012. ↑ The Sports Network (January 6, 2012). "NHL AND NHLPA REACH DEAL ON COLLECTIVE BARGAINING AGREEMENT". BellMedia. Retrieved January 6, 2012. ↑ "2012–13 NHL regular season schedule". National Hockey League. Retrieved April 28, 2013. ↑ "Despite Lockout, Fans of N.H.L. Have Tuned In". nytimes.com. June 22, 2013. Retrieved June 25, 2013. ↑ Sandomir, Richard (1994-09-10). "Fox Outbids CBS for N.H.L. Games". New York Times. Retrieved 2008-03-20. ↑ Sandomir, Richard (1996-04-30). "Fox Is Playing It Safe With N.H.L.". New York Times. Retrieved 2008-03-20. ↑ Houston, William (2004-04-10). "CBC livid as league bows to Americans". Globe and Mail. Toronto. Retrieved 2015-11-19. 1 2 3 Sandomir, Richard (2005-08-19). "Cable Company's Ambition for a Network Proves a Salvation for the N.H.L.". New York Times. Retrieved 2008-03-20. ↑ Sandomir, Richard (1998-08-07). "Best N.H.L. Action Is the Battle Over TV Rights". New York Times. Retrieved 2008-03-20. ↑ "NHL inks TV deal with NBC". CBC. 2004-05-19. Retrieved 2008-03-20. ↑ Di Sciullo, Dan (2007-07-24). "Bettman's quiet summer belies NHL's current predicament". The Sporting News. Retrieved 2008-03-20. ↑ "NHL, Versus extend TV contract by 3 Years". yahoo.com. 2008-01-22. Archived from the original on 2011-06-29. Retrieved 2008-04-06. ↑ Fang, Ken (19 April 2011). "NBC/Versus To Air NHL Games For The Next Ten Years". Fangsbites.com. Archived from the original on 18 October 2011. Retrieved 19 April 2011. ↑ Hackel, Stu. "NHL's new TV deal is a winner". SI.com. Archived from the original on 2011-04-25. Retrieved 2011-04-24. ↑ "Tune in every Thursday for the NHL Hour". NHL. 2008-05-29. Archived from the original on 2008-05-14. Retrieved 2008-05-29. ↑ Chris, Peters (August 4, 2014). "Report: Gary Bettman made $8.8 million during lockout season". CBS Sports. ↑ Mickle, Tripp (July 16, 2010). "NHL's legal costs soar; Bettman's pay tops $7 million". Sporting News. ↑ Terlep, Sharon (2014-06-03). "Canada's National Pastime: Booing NHL Commissioner Gary Bettman". The Wall Street Journal. Retrieved 2015-05-31. 1 2 Greenstein, Kevin (2008-04-07). "Bettman Steers NHL in Right Direction". The New York Sun. Retrieved 2011-04-09. 1 2 "Exclusive: NHL Commissioner Gary Bettman". Maxim. 2008-12-22. Archived from the original on 2011-09-11. Retrieved 2011-04-02. ↑ Proteau, Adam (2010-06-10). "Gary Bettman shouldn't present the Stanley Cup". The Hockey News. Retrieved 2011-04-14. ↑ O'Brien, James (2010-06-10). "Maybe Gary Bettman should let someone else hand out the Cup". NBC Sports Pro Hockey Talk. Retrieved 2011-04-14. ↑ McIndoe, Sean (2013-06-24). "20 Years of Awkwardness: A Celebration of Gary Bettman Stanley Cup Presentations". Grantland. Retrieved 2016-06-13. ↑ Peters, Chris (22 May 2014). "NHL commissioner Gary Bettman named Sports Executive of the Year". cbssports.com. Retrieved 23 May 2014.